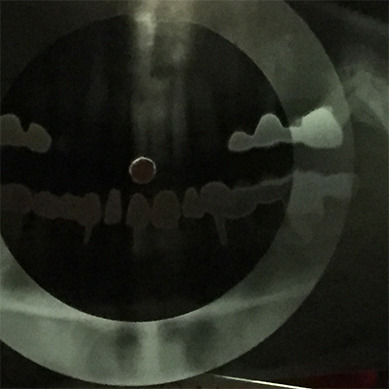 handcut in x-ray-film. limited 80 copies. The faszination of old Garage Punk records exists from the unruly will for roughness, being a fan and glanders in the music. The wish not to cut the diamond but smash it identifies Garage Punk. To clarify the chronological range we refer to the heritage of Crypt, one of the few legitimate successors from the idea of Rock'n'Roll and Punk. It is more than just an act of boys in Chucks and denim jackets but the promise that Rock'n'Roll can and should be nonconformist. 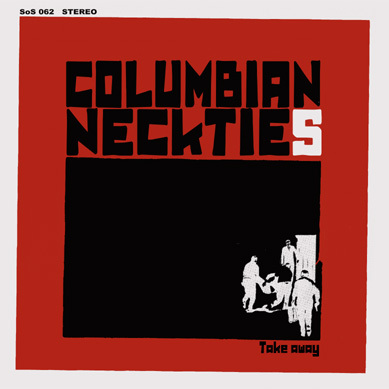 The Columbian Neckties, founded 1998, are releasing 11 years after "Takeaway" their fourth album "It's all gone". Still playing the best Highspeed Garagepunk with a good pinch of MC5 Rock the world ever listened to. Every fan of New Bomb Turks, Guitar Wolf, TV Killers or Cellophane Suckers knows what I am talking about and will put this record on the turntable. It is recommended to the rest. Recorded the 14th and 15th of October 2015 in Pigsty Studio by Kasper Westeraa. Clean recordings and levels set by Kasper Westeraa. NO mixing. Mastered by Wolfgang Hazelwood.
'' 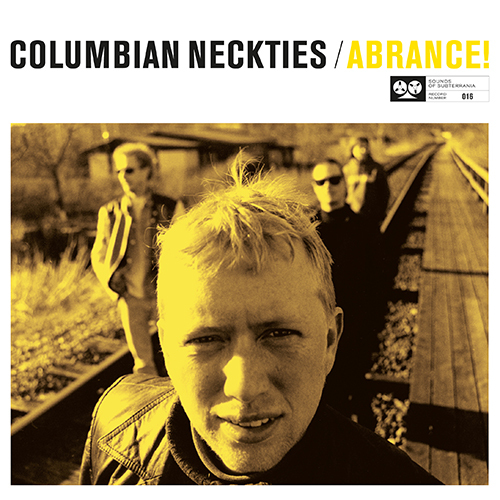 Let's keep this simple: Columbian Neckties is the Band I've had the most personal experience with, as a label. On top of that, they are one of the few Garagepunk-outfits, who can simultaneously count Names such as Tim Warren (Crypt Records),Alfred Bradford (Green Hell) as well as Lars Krogh (Bad Afro) amongst their die-hard Fans, apart from myself that is, of course! Enough reason to be straight-up subjective when it comes to this band and that's exactly my point here. 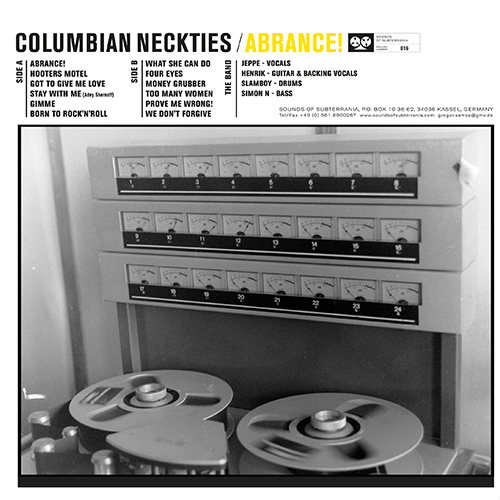 To me, Columbian Neckties is Europe's finest Garagepunk band and definitely in the top 5 internationally. No one shreds the guitar faster than Henrik and no one comes close to Jeppes vocal delivery. Everything just seems to fit perfectly with the Columbian Neckties. This is Punk – Punk and not Rock in disguise. Garage will always be Garage and that means getting your hands dirty. Their shows never fall short from being total revelations and are cramped with energy to an extent, that you could illuminate the Autobahn at night, if we were able to feed that energy into our power circuits. Most of all, Columbian Neckties are real! 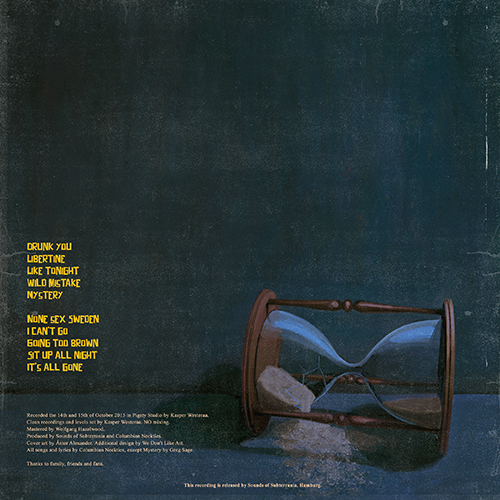 Not just Students jamming around, No Dressmen, no 'we'll-do-whatever-the-industry-can-sell' – types, but rather the boys from nextdoor who happen to play mindblowing Garagepunk. This is what counts and sticks to both brain and heart. 02. She’s The Man ! 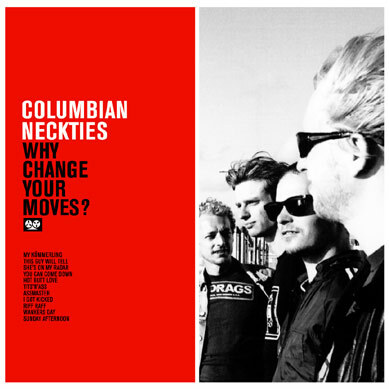 COLUMBIAN NECKTIES - Why change your moves? 01. why change your moves? Yes!! 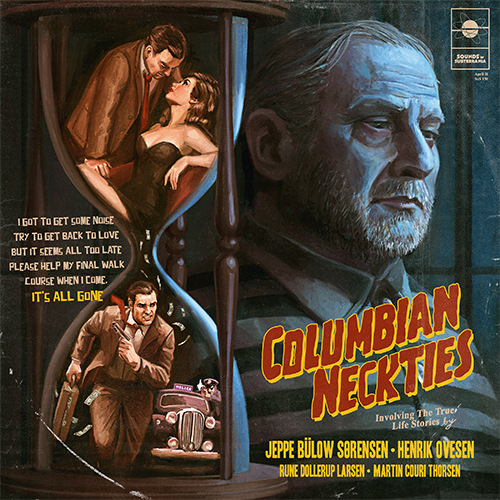 Die neue Columbian Neckties ist mal wieder ein Killer! Direkt der Opener (gleichzeitig das Titelstück) rast über einen hinweg wie ein Hochgeschwindigkeitszug im Tiefflug. Der Sound ist gegenüber dem Vorgänger um einiges aufgespeckter und ebenfalls neu sind diese fiesen Hardrock Riffs in klassischer Rose Tattoo bzw. AC/DC Tradition, die einem in einem Affenzahn um die Ohren geblasen werden. Wer jetzt allerdings meint die Dänen würden auf abgefahrene Züge aufspringen irrt gewaltig. Das ist kein Skandinavischer Action Rock, sondern höllischer Turbo Punk'n'Roll, der dermaßen konsequent im roten Breich fährt, daß einem ganz Angst und Bange werden kann.